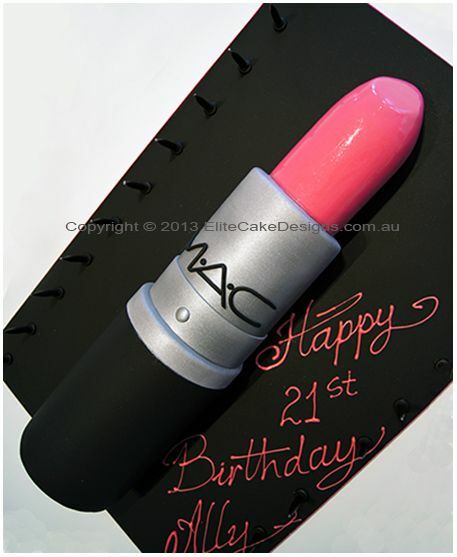 10 MAC Makeup Cake For Any Makeup Geek! 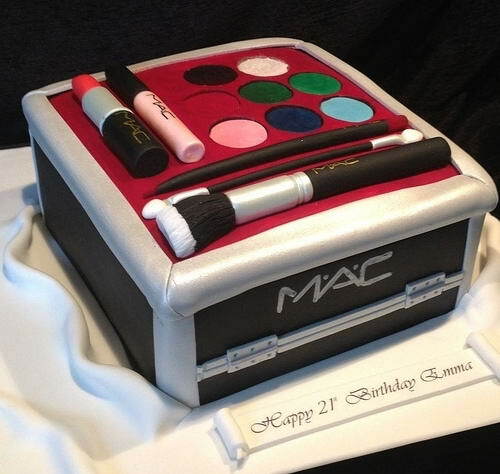 Mac makeup cake, which could be the best birthday cake ever for a mac fan! This cosmetic brand has become so popular that anyone would love to have a bit of it in their makeup collection. 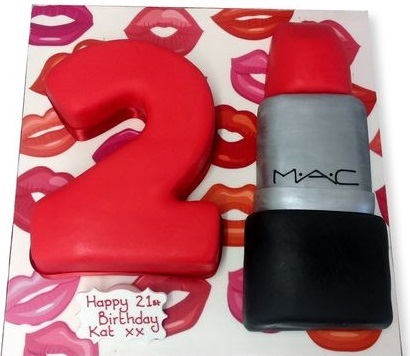 Consider a lipstick that you love so much and you are getting it as a cake for your birthday! Wouldn’t it be fun? 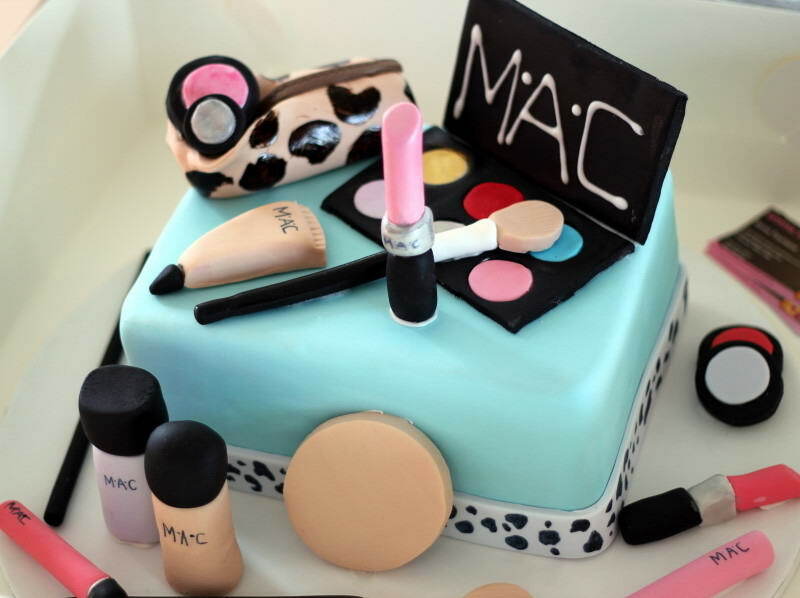 To make a mac makeup cake by yourself, you can always start with a simple recipe. You can make it for yourself for any of your friends who would really love to have such a beautiful and gorgeous cake for her birthday! You can start with your favorite cake mix or recipe to make the interior. You can also choose different flavors for the cake such as strawberry or anything else of your choice. You will need to choose a design or pattern with which you have to go with for the cake shape. 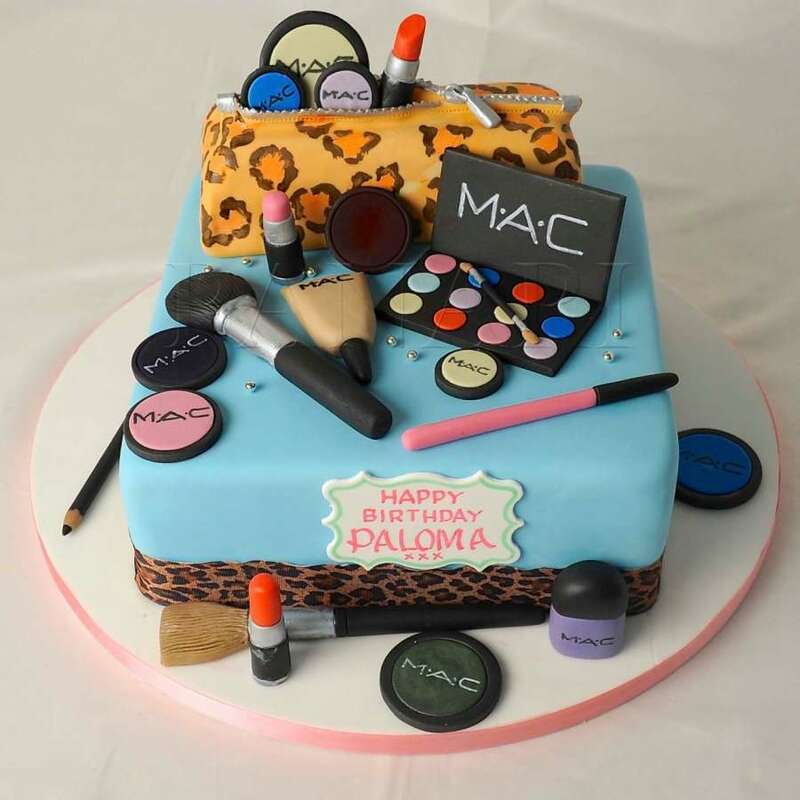 To start with a simple one, you can make a round shaped cake where you can make the different makeup items on top of it. Make two layers of cake of your favorite recipe and prepare the frosting of your choice. Stack both cakes by applying the frosting in the middle. Now cover the whole cake with the frosting and then you are going to do the interesting part of making this cake. Choose a color of the base which will be the fondant that you are going to cover the cake with. You can go with pink or white whichever you prefer. Now prepare the required colored fondant and roll it out. Place the fondant on top of the cake and then shape it all over the cake to make sure that it has been set properly. Use your fingers or a knife to set up the edges on the sides and cut the excess part. Now you can give a little dramatic touch by adding a bow by wrapping the edge of the cake which you can do with brown or black fondant. Roll out the fondant and cut it in a long shape to place it on the edge. 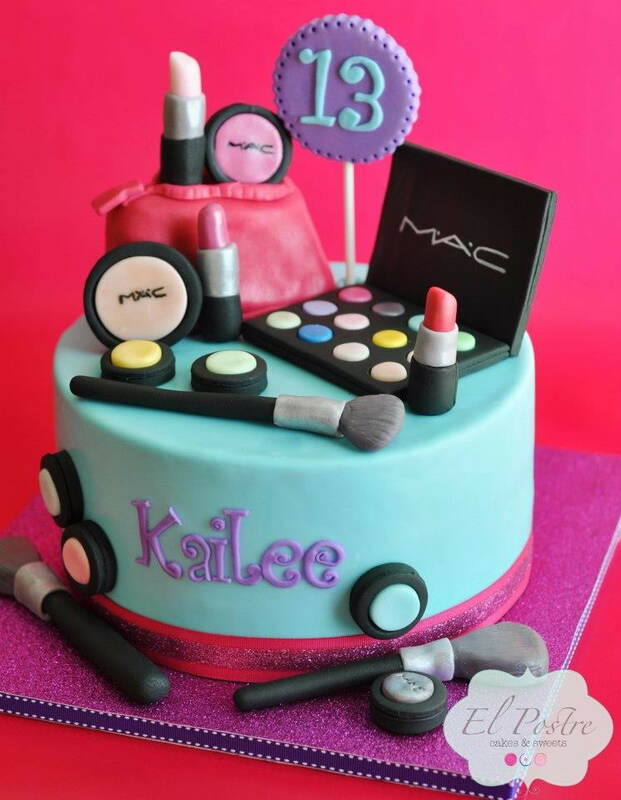 You can apply a wet wash by using a brush which will help to stick the fondant properly. After that, you will make the cosmetics which you have to do very carefully by using the required colored fondants. 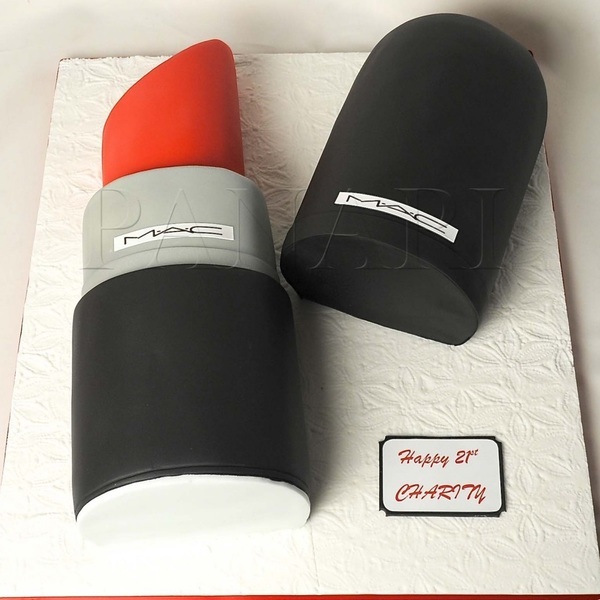 To make a lipstick, you will need black, grey and the lipstick color in the fondant. You can either do the whole thing with different colored fondant or you can make it with white fondant and apply edible color to give the right shape and design. Make a lip gloss in the same way. Making these cosmetics would be really easy because all you have to do is check out the shape of these things and then use your hands and fingers to make the required shaped cosmetic. To write the word MAC, you can use a fine paintbrush along with a drop of black food coloring. You can also make the blush, makeup brush, foundation and what not. 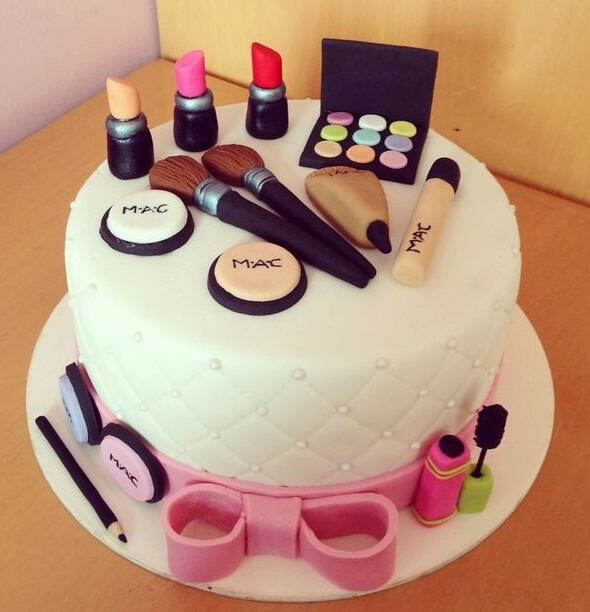 Just think about the person for whom you are making this cake and what would she love to see over the base. Get creative by using your imagination to make the best cosmetics up there. Have a finishing touch with a little bit of glitters if you would prefer so. And that would be all! 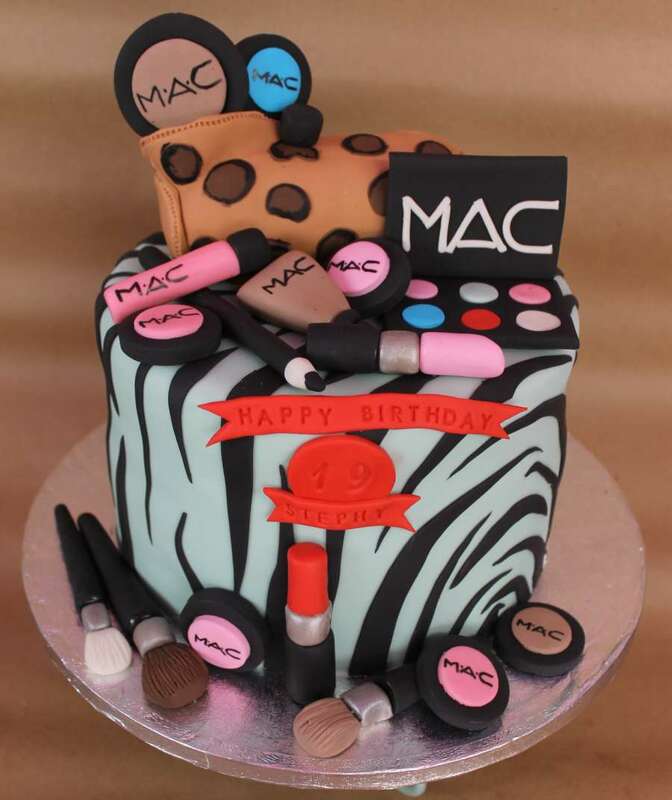 What would be more creative to make a mac makeup cake for a girl? Now the other option that you can always consider when you are not planning to make one by yourself is to buy one. You can do is very easily by checking out at the cake shops. Most of the cake shops take these type of customized orders where you can let them know about your requirement and they will create the exact same thing for you. 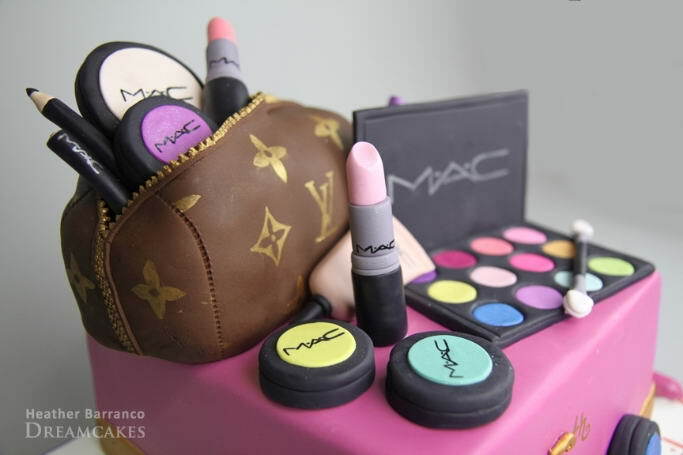 So don’t be late and prepare the best mac makeup cake ever for your friend’s birthday!